I have switched to Carrot for my watch - I paid for the weather underground data because there is a station about 3 streets away and it’s lretty accurate. For my phone I use a combination of Willy Weather and Rain Parrot. You can turn off the silly comments in Carrot weather, which I have done and I really like it now. 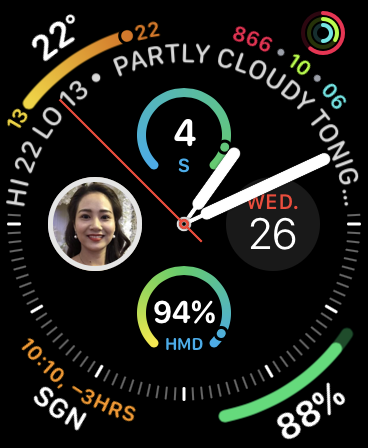 Maybe I’ll look at Carrot again when I get the next watch, for now I am stuck on Series 1. 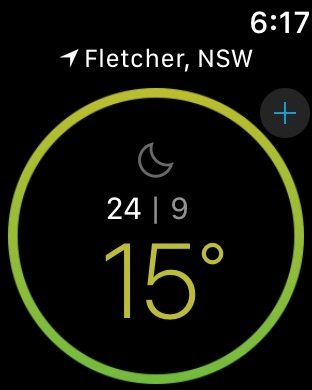 The latest update to OzWeather now includes some support for the extra complications on the Apple Watch Series 4. 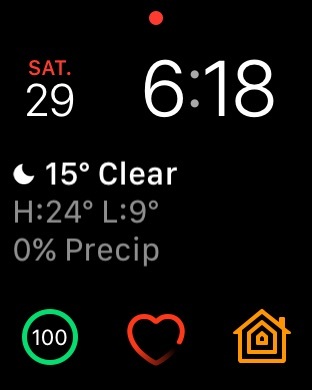 Back to trying to find a decent weather app that has watch support as have become so dependent on Pocket Weather and judge all others by this one. Oz weather has limited stations and doesn’t include the closest ones to me also misses the weekly look ahead for % chance of rain and wind speed, which as a mad cyclist always looking ahead to wind forecasts. Weatherzone looks pretty but like a lot of pretty things doesn’t appear to be that smart, as gives wildly fluctuating differences to what Pocket Weather reports. So that leaves me to give Carrot a try but knowing it doesn’t support BOM data is bit of a bummer, but did read on a reddit forum that the developer is looking at adding BOM data but guess that would need an ultra premium subscription, but does appear to have best watch app and a very responsive developer. 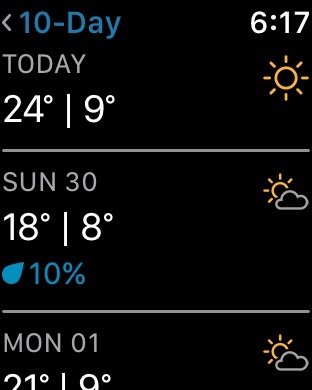 Did read a rumour on twitter that Bjango the creator of istat menu was looking at making an Aussie weather app, which if true would be great, going off what he has built in the past. So any other recommendations out there to try? I use Carrot which (if you buy the subscription) will use Weather Underground data. There is a station up the road from me so the data is really accurate. Ok will give Carrot a try, why not have 5 weather apps on your phone! I like Wunderground too. 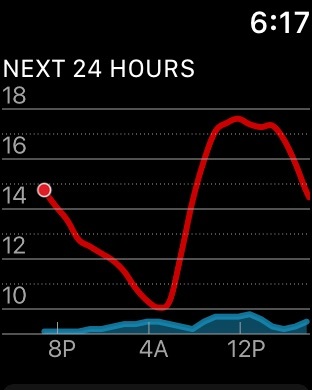 I’m not keen on the subscription model, so have gone with the free Wunderground app (and Wunderstation on my iPad) and whatever they’ve done with the app, its much better behaved than it used to be and is turning up on my watch very nicely. Its good to have local stations, theres one just a couple of blocks from me and its perfect. I also have the actual BOM app if I want a look at weather elsewhere. The BOM app is the kind of thing that should not be supported. It is not as good as say, pocket weather. And the provision of the app by BoM means that small start ups like pocket weather are even less likely in the future. A classic example of government getting too big. BoM should conctrate on observations, and making these data available for innovative companies and start ups to produce the products we know and love. A government run app will never be as good. Government is by its nature and design not agile. I know many of the executives in BoM, and their heart is in the right place, but seriously, concentrate resources on the public good aspect and maximise observations, and leave the tools and models to third parties. Please. Last night I heard that Bjango (of iStat Menu) is developing one with BOM data! Interesting. Why not just buy Pocket Weather? I believe Shifty Jelly were shopping it around at one point. Why not just buy Pocket Weather? Who should buy it? BJango? I would not hold out much confidence with Bjango. Great company, great apps, but I’d expect the BOM app or even better, mobile-friendly BOM site to outlive yet another weather app. WYe. Its economic term is “crowding out”. It’s what happens when government extends itself in areas done perfectly well by the private sector already. I don’t really see the point in developing a whole new app from scratch when there’s an existing app with infrastructure already on the market they could take over. It might be hard for them to monetize on the purchase though: let’s say, for argument’s sake, they purchase Pocket Weather and associated infrastructure for $10,000. They won’t make any money from existing customers who’ve already purchased the app, so they’ll need to maintain it and rely on new app purchases to bring in money. There’s also the option of moving to a subscription model, but that may piss off customers who’ve bought the app and are suddenly being made to pay again. My whole point being though is Shifty Jelly shopped the app around, and if Bjango wanted to make a weather app, they could’ve given that consideration. Maybe they did, I dunno. I’m always happy to pay for apps developed by Australian developers, and I am not price-sensitive to Australian apps, but then I used to pay good money for apps on Palm OS; iOS apps are relatively cheap. If Bjango make a weather app I’ll take a look, but it’s going to take a lot to move me away from the verbal abuse Siri gives me when I ask for a weather report from Carrot. It makes my day! but then I used to pay good money for apps on Palm OS; iOS apps are relatively cheap. Palm OS apps weren’t something I bought without consideration and I didn’t treat them as disposable in the same way I treat many cheap iOS apps. I treated them in a similar way to expensive desktop apps, purchase decisions were researched (at least somewhat) and then I’d buy the app that suited my usage as much as my budget allowed. With iOs I’m more likely to go… “well it’s only a dollar or few… why not try it and see what it’s like, if it doesn’t work out I’ll look for something else”.